This workshop is our introduction to shabby chic painting. 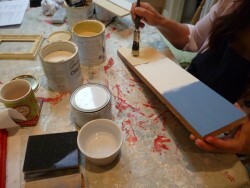 The techniques you learn here can be used on furniture or anything else you choose to paint. We teach you about different chalk based and eggshell paints you can use to paint furniture and other items. We teach you the most common techniques for painting a smooth finish or a textured finish. Learn about the different brushes and other equipment you can use. We also teach you how to use crackle glazes and waxes to age your furniture and how to distress your furniture to give it that real shabby chic look! Please note that we are not tied to any paint manufacturer or brands. All the information and advice we give you is unbiased. No experience necessary, just enthusiasm! We arrange workshops as required at venues close to you. Please contact us to let us know where you are and which workshops you'd like to do. Payment for workshops can be made by cash, bank transfer or online prior to the workshop taking place. Workshop 3 - Not Just Furniture!